We enrich our own lives every day. We take ourselves out to movies, restaurants, museums and gyms. We play board games with friends, ride our bikes and ski in the winter. Sometimes we make our lives so busy that our minds barely have time to rest! While we’re out, however, our companions often get left home. They crave intellectual and physical challenges too, and they depend on us to provide new experiences and activities. One of the best solutions to a bored dog is a treat-dispensing toy. These toys allow your dog to use their brain as well as their brawn. Remember, dogs are scavengers by nature and puzzle toys are a great way to give them mental exercise. A few of our favorites are listed below. You can find them at shop.wihumane.org or any of our three retail locations in Milwaukee, Saukville or Racine. 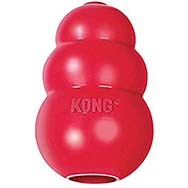 Kongs are made of a flexible material and are one of the favorite toys of dogs at the Wisconsin Humane Society. Made of a soft, yet durable rubber, and available in several varieties, Kong toys are designed to hold food or treats that your dog must ‘dig’ out over time. 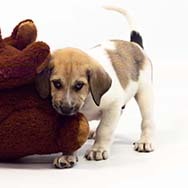 These versatile toys can hold anything you can imagine, including hot dogs and yogurt, but the most common combination is the dog’s regular kibble mixed with a bit of peanut butter. 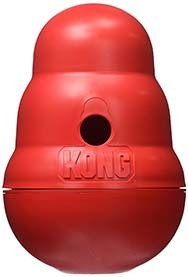 Kongs can also be stuffed in layers, for example: putting kibble on the bottom inch, then a little canned tuna, then shredded cheese, then dry treats and finally peanut butter. Freezing foods inside a Kong extends play time and can also soothe a teething puppy. Also made by Kong, the Wobbler is a unique, food-dispensing toy that you can potentially utilize every mealtime. Scr ew off the bottom of the toy, fill it with your dog’s food, and watch as they have to bat it around and knock it over to get the food out. This is also a great solution for slowing down those dogs that tend to ‘gulp’ their food. The Tug-a-Jug is another interactive toy that provides multi-sensory stimulation. 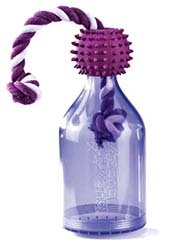 Made of a super-strong clear plastic, dogs can see the treats or food inside, smell them through scent holes on the bottom of the toy, touch the massaging rubber ball and durable rope, hear the contents as they shake or roll the toy around, and finally taste the yummy rewards! This is one of the more mentally stimulating toys around, so may not be suitable for beginners. There are many different types of treat dispensing toys and it's important to know which ones will occupy your dog. Always supervise a few sessions with any new toy or treat to make sure they will be safe. Get creative with how you fill these toys and don’t forget that a dog with something to do is a happy dog.